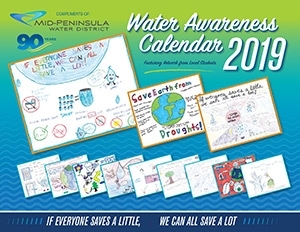 On Thursday, January 24, 2019, MPWD hosted the twelve winners of its Annual Water Awareness Calendar Contest. This year’s calendar – which features winning student entries that promote water conservation – helps mark the MPWD’s 90th year anniversary. Local 3rd, 4th, and 5th grade students from schools in the MPWD’s service community were invited to submit posters incorporating the MPWD’s water conservation slogan, “If Everyone Saves a Little, We Can All Save a Lot!” An unprecedented 189 poster entries were received from Belmont Oaks Academy, Immaculate Heart of Mary School, Cipriani Elementary School, Nesbit Elementary School, and San Carlos Charter Learning Center. The twelve student winners were invited to the January Board of Directors Meeting where they received certificates of recognition and complimentary calendars, while gifts cards were additionally presented to the grand prize winner and two runner ups. The MPWD also recognized Mrs. Butts and Ms. Stendal, who teach 3rd grade classes at Cipriani School, as the teachers with the most class participation this year.